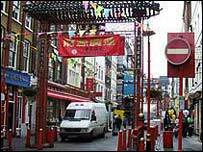 Immigrant workers are stepping up their protest against changes to immigration laws, with a rally at London's Chinatown on Sunday. A policy change in April means immigrant workers must now wait five rather than four years before they can apply for settlement in Britain. Protesters said it created uncertainty for more than 400,000 legal workers. On Monday they will present a petition with 10,000 names to the prime minister at Downing Street. Immigrant workers contribute more than £1bn to the UK economy said campaign organisers, including the North London Chinese Association and the Voice of Britain's Skilled Immigrants. More than 50 MPs have signed an early day motion condemning the legal change. Protesters are due to present their concerns to immigration minister Liam Byrne on Tuesday. They claim it is "unfair" to existing Work Permit and Highly Skilled Migrant Programme Visa holders, who came to the UK on the understanding they would be able to apply for settlement and begin a more stable life after four years. The Home Office said the changes brought the UK "in line with the European norm for these purposes". The rally follows a demonstration outside the Houses of Parliament in June.